The Begwyns is a beautiful National Trust owned area north west of Hay on Wye, from where there are outstanding views of the surrounding mountains. It is possible to drive there. The route described here is intended to help walkers, campers, and those using public transport to access the Begwyns on foot. The first section, just under two miles, takes you to the Begwyns, and you can either explore to your heart’s content, or follow the loop walk described here, before following your earlier footsteps to return to Clyro. Grade: Moderate – the National Trust who own the Begwyns, describe the walk to the top as “a mountain top walk with none of the climb”. There is in fact a long gradual grassy ascent – but very gentle and civilised. 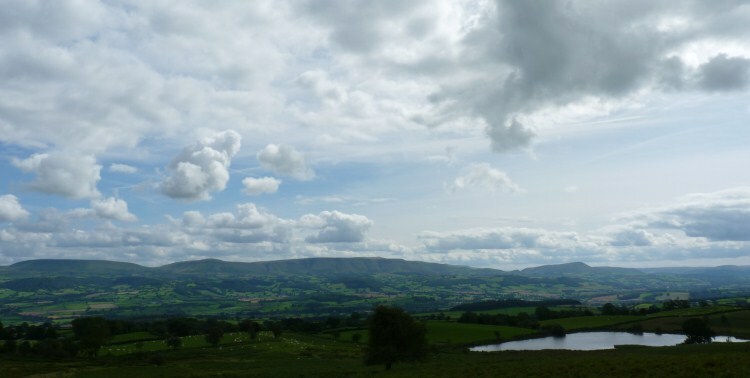 Key Features: Amazing 360 degree views of the Black Mountains, Brecon Beacons and Radnor Hills; the Roundabout – a circular, stone enclosed and entirely unexpected glade at the highest point. Refreshments: The Roundabout contains a crescent shaped stone seat where you can eat a picnic and enjoy the views, sheltered from the wind; Clyro has a shop and pub; Hay on Wye has lots of good places to eat and drink, but a very special mention has to go to my own personal addiction – Shepherd’s icecream – generous portions of sheep’s milk icecream sold from the Shepherd’s icecream parlour in the middle of Hay. Pass Cwm cottage on your left, and carry on up the road for about another 200 yards, and where the road steeply bends to the right, on your left you will see what appears to be a hard surfaced private drive. Go left along this. Continue walking for about half a mile, past two white storage units on your right. 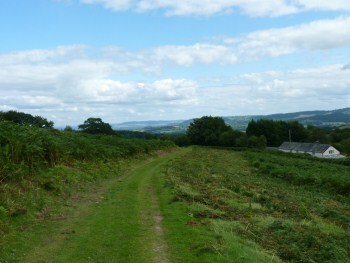 Soon, on your left you will see a sign to Great Cwm, but you continue on the right hand track. You will reach two houses, with apparently nowhere for the path to go. As we discovered, after some time and with help from a kindly householder, there is a hidden gate. Go past the first house which is on your right, and immediately ahead there is a wooden fence. You need to go through the gate in this fence and you will see a path ahead of you (and quite a few security cameras). After a few yards you go through a metal bar gate, and then head diagonally left towards another metal bar gate at the end of the field. In fact there are two barred gates and you want to take the one which is on the left. (There is also a stile, but when we did this walk the stile and any path which was supposed to lead to it were obstructed by an electric fence). Follow a very poorly defined path heading towards a white cottage. 100 yards or so before you get to the cottage turn right across a grassy bridge. Just after the bridge you veer right and then head leftwards up towards the top of a bank which will take you to the right of the cottage. Continue along the grassy lane which is defined by two wire fences, one on each side of the lane. The track opens out onto a field, and you follow the left hand edge for 30 yards or so, but then turn right at the top again following the hedgerow, and finally turn left again – still keeping to the hedge as it curves left into another field. You will then come to a metal bar gate into an open field. When you reach the open field go diagonally right to the metal bar gate which will take you on to the road. Turn right across the cattle grid, and then left – you’re now in the Begwyns! Go right diagonally up a gravelly path, and then follow grassy trails to the first and lower of the two grassy mounds which make up the Begwyns. In fact as you go up, you can see the higher mound in the distance crowned by a tuft of trees – but because of the perspective you’re looking at it from, it appears to be lower than the first mound. 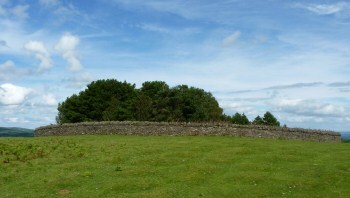 Continue walking along the top of the ridge, over the small road – and then head towards the higher mound, with its distinctive round enclosure at the top. To return from the Roundabaout retrace your steps for about 20 yards, and take the trail which diverges from it towards the left. Cross-over the road, still keeping to the left hand side of the top of the ridge, until you see a pond beneath you (in a rut which cuts across the ridge). Take the grassy track which goes from the left hand side of this area. Stay on the most well trodden path (not the less well trodden one which goes off to the left after about 30 yards). Keep straight on across various junctions (in other words don’t go left down the hill). Eventually you come to a wire fence. Go right here, follow the gravel track which turns grassier, then by a cairn, and you will find yourself on the trail which you originally came up on. When we originally set off to do this walk, we intended to do a nice circular walk covering a range of types of scenery. However, the section of the walk between Cwm cottage and the Begwyns turned out to be so fraught (it took us 1 ½ hours to go 1½ miles) that we took the cowardly course of action and just came back the same way rather than try and carve out a new route. The obstacles included: the public footpath we intended to start on was not marked, and even our best detective work couldn’t locate it, so we went along the drive as described above. Then, despite a yellow arrow indicating that we took the right track towards the two houses, the path appeared to just finish. We assume that had been diverted, and set out to find out where it had been diverted to. Without help from the friendly householder, we would not have thought of going through the gate in the wooden fence – it just looks like someone’s back garden and there were no footpath marks. We then managed about 100 yards, only to find an electric fence was blocking off what we assume was the footpath – since there was a stile. Having navigated this particular obstacle, we followed a very indeterminate path and ended up in someone’s front garden. They were also kind and explained where the footpath was supposed to go. The next section, through fields, was similarly obscure – so hopefully the directions above will mean that you can follow this route without being stung by nettles, electrocuted, reported to the police for wandering into people’s private property, or any other misadventure. The Begwyns itself is lovely, and the Roundabout, with its beautifully crafted stone wall, atmospheric pine trees, and panoramic views is very special.